Birmingham, Alabama (November 13, 2017) – A local area rescue group now has its second canine ready to answer the call to action. 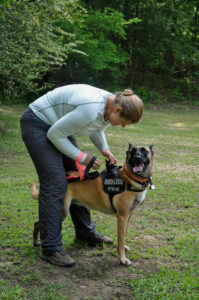 Canine Brienne is the newest member of Central Alabama’s Red Mountain Search Dog Association (RMSDA) to gain national certification from the National Association for Search and Rescue (NASAR). Brienne and her handler Emily Smythies received certification at an event held at Chapman Mountain in Huntsville, Alabama on November 12th. The NASAR Canine SARTECH III certified team is the Red Mountain Search Dog Association’s second duo to be nationally certified for the search of missing and lost persons whenever local law enforcement agencies request assistance. Canine Sadie and her handler Kenny Powell gained certification in February. The Red Mountain Search Dog Association is a 501(c)(3) Non-Profit Organization providing supplemental Emergency Medical Services, manpower, specialized equipment, and skills to public safety agencies and communities across Central Alabama.